emperumAn says “My protection will be according to the nature of the soul; ascertaining your own nature, you submit yourself unto me” and ALavandhAr as done [by nammAzhwAr] in thiruvAimozhi 2.9.5 “siRappil vIdu“, says “there is no such restriction for me; this entity (me) which is known as AthmA, is submitted unto the divine feet of your highness”. Let me be any one among SarIram (body) etc and characteristically be of any nature [svarUpa – nature and guNa – qualities]; [I have no restriction on such aspect] thus, I, this entity is submitted by me at your divine lotus feet right now. vapurAdhishu – Talking about dhEha (body), indhriya (senses), mana (mind) and prANa (vital air). There is difference of opinion on what is AthmA – there are those who say AthmA is one among these [body, senses etc] and there are others who says AthmA is beyond matter, and that which is identified by gyAnam (knowledge), Anandham (bliss) etc. Let the AthmA be any one of these. 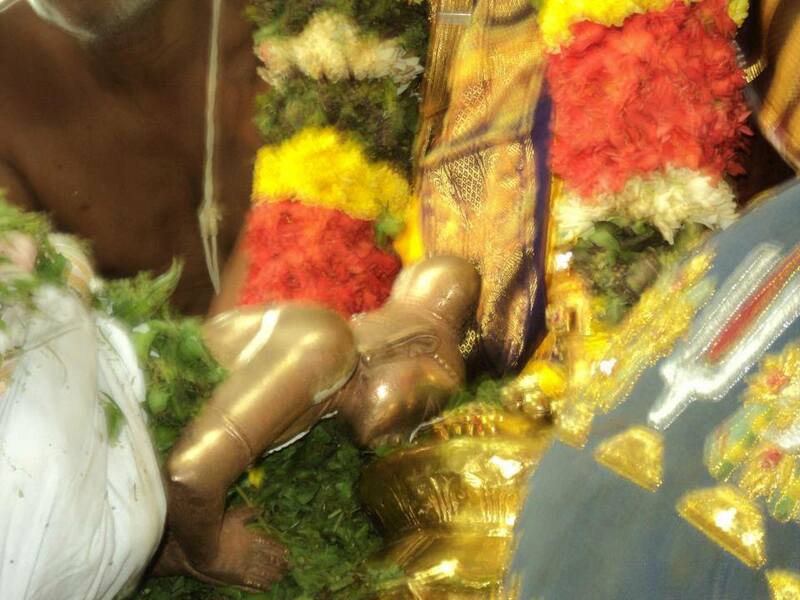 guNathO’sAni yathAthathAvidha: – While defining the characteristic of the AthmA, there is difference of opinion in it being aNuthva (being miniscule), vibhuthva (being omnipresent), SarIra parimANathva (being a transformation of body), nithyathva (being eternal), anithyathva (being temporary) and gyAthruthva (being the knowledge/knower). I don’t care if any of these is the characteristic of the AthmA. thath – Since, I do not care about AthmA’s nature and characteristics. aham – I, who is different from matter, who is the soul, who is shining visibly. thava pAdha padhmayO: – At the enjoyable divine feet of your highness, who is the protector. adhyaiva – Even if the AthmA is kshaNika (only exists for a moment), I am submitting in that same moment. mayA samarpitha: – is submitted by me. [Many pramANams are quoted for submitting oneself] yajur brAhmaNam 3.7 “yO’hamasmi sa san yajE” (Whoever I am, let me be that (and submit myself)). yajur brAhmaNam 3.7 “yasyAsmi na thamantharEmi” (For whomever I am a servitor, I will not leave him and go to anyone else). mahAbhAratham SAnthi parvam 343.24 “AthmA rAjyam dhanam mithram kaLathram vAhanAni cha | Ethath bhagavathE sarvamithi thathprEkshitham sadhA ||” (uparicharavasu always thought “[my] self, kingdom, wealth, friends, wife, vehicles are all for bhagavAn“). SrI rAmAyaNam ayOdhyA kANdam 82.12 “katham dhaSarathAjjAthO bhavEdh rAjyApahAraka: | rAjyam chAham cha rAmasya dharmam vakthumihArhasi ||” (How can one born to dhaSaratha steal the kingdom? Both the kingdom and I are SrI rAma’s possessions. You have to state the truth here). This entry was posted in Other, sthOthra rathnam on February 21, 2017 by Sarathy Thothathri.